20thCenturycollectables.co.uk: Current stock: A striking chandelier of 36 blue, turquoise and aquamarine handmade glass discs from our own studio all hung on a chromed steel frame. 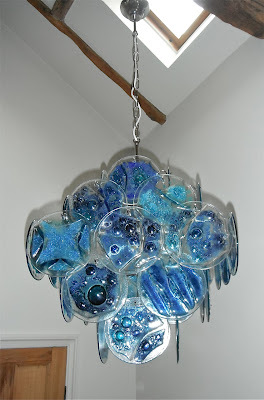 Diameter 45cm Length 56cm plus hanging chain length to suit. Current stock: A striking chandelier of 36 blue, turquoise and aquamarine handmade glass discs from our own studio all hung on a chromed steel frame. Diameter 45cm Length 56cm plus hanging chain length to suit.